The RDS LOADMASTER α100 is an all-new CAN based system combining cutting edge sensor technology and signal processing techniques providing precise and consistent weight information. With the ever increasing focus on productivity, LOADMASTER α100 has been designed to operate within the fastest loading environments and toughest of conditions compensating for uneven, sloped ground and restricted loading areas reducing cycle times and maximising tons per hour performance. 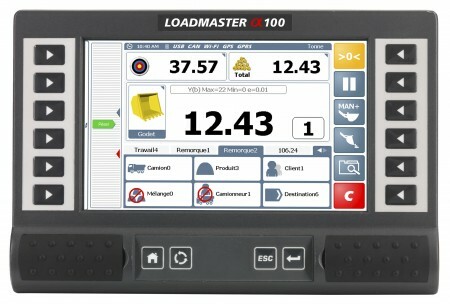 The new RDS LOADMASTER α100 uses a 7” colour, resistive touch screen display and additional physical keys providing a modern and ergonomic operator interface. The system continually measures hydraulic pressure using up to 4 sensors. The pressure signals are captured and filtered through a weighing ‘arc’ provided by inclination sensors measuring the angle of the main boom. SQL database capability with up to 8 reference fields providing virtually unlimited inputs of products, customers, trucks, hauliers, locations, destinations, mix blends and notes. There is a blend facility with an infinite number of mixes and products.